Facebook founder Mark Zuckerberg’s visit to Nigeria, his first to sub-Saharan Africa, has put the country’s tech businesses firmly in the world’s spotlight. Zuckerberg staged a surprise visit to the country’s economic capital Lagos on Tuesday and his first stop was a local innovation center and tech hub in Yaba, an area on the mainland of Lagos known as Nigeria’s Silicon Valley. There was no fanfare amid tight security and some of those working at the Co-Creation Hub, called CcHUB, didn’t even know Zuckberg was coming. He appeared nervous, a little startled even, as he launched into an impromptu speech about why he was there. At the CcHUB, he talked to children at a summer coding camp and entrepreneurs who visit the center to build and launch their apps. Zuckerberg thrilled Nigerians by walking around the streets of Lagos without any signs of armed guards or heavy security. He was also spotted jogging on the Lekki Bridge on Wednesday morning. Figures released Wednesday show Nigeria has officially dipped into recession as its second quarter GDP fell by more than 2% compared to last year. However, running a business in the country has always been tough for young entrepreneurs such as Bosun Tijani and Femi Longe, who co-founded the hub Zuckerberg visited in 2011. Successful startups in Nigeria thrive against the odds of weak infrastructure, anemic power supply and general lack of funding and investment. Tijani told CNN that Zuckerberg’s visit would give Nigeria’s fledgling startup scene the shot in the arm it desperately needs. “By coming here first, he’s given a lot of hope to young people here,” Tijani said. He added that entrepreneurs like Zuckerberg were inspiring because his approach to Facebook has never been about making a lot of money. “It’s been about creating something that’s going to change the world and obviously if you do that, you are bound to reap the benefit,” Tijani said. Like a lot of entrepreneurs on the continent, the founders of CcHUB have been quietly plugging away before catching the attention of one of the world’s biggest tech founders. Zuckerberg singled out their business because of their proven track record in building and incubating startups that tackle the country’s myriad social issues such as Lifebank, an app that locates available blood supplies and delivers it to hospitals. 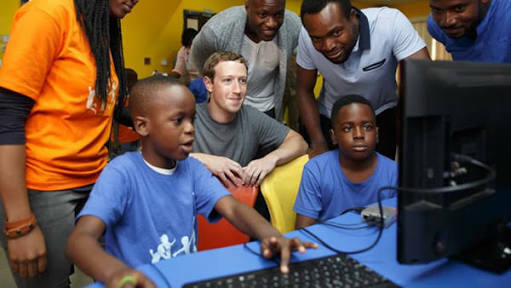 Another entrepreneur who met Zuckerberg was Adebayo Adegbembo, who runs Genii games, a platform to make it easier for kids to learn about African culture both in Nigeria and the diaspora. He said Zuckerberg learned a few words of Yoruba and spoke of his love of languages. “To have Mark show that kind of interest in us is a huge stamp of approval,” Adegbembo said. Tijani and his business partner had a vision of creating a tech business district and persuaded the government and a local cable provider to install fiber optic cables on their street providing affordable and fast Wi-Fi access to anyone within the hub’s vicinity. When they started there were five tech businesses, now there are 60 and the area attracts an increasing number of entrepreneurs. During a Q& A streamed live on Facebook on Wednesday, Zuckerberg talked about plans to make the company’s tools and apps more affordable for SMEs in the country. He added that he was proud of recently putting the Hausa language, largely spoken in northern Nigeria, on the platform and revealed plans to expand to other Nigerian languages. Nigeria is the largest market in Africa for Facebook; 16 million Nigerians using the platform monthly, with 7 million logging onto the site daily: 97% of them on mobile, according to figures from the network. Zuckerberg has also made no secret of his interest in Nigerian startups and other African tech industries. In June, he invested millions of dollars in a Lagos-based startup called Andela via the Chan Zuckerberg Initiative and in May he launched Free Basics, a partnership with a local telecoms provider, which allows people to browse websites for free, a very appealing prospect in a country where data prices can be prohibitively high. Although, it is not without controversy as critics have said it violates the central tenets of net neutrality, which stipulate that all Internet content and users should be treated equally. Cherry-picking free content isn’t considered fair or right, according to the critics. But it appears to be more than just the numbers stacking up for Facebook and Zuckerberg. He has said he is in the country to listen and learn and take ideas back to California on how to support businesses across the continent. He’s also very interested in the creative partnerships and in exploring where tech and creativity intersect. While in Lagos, he met with leading figures in Nigeria’s Nollywood film industry and talked about how the burgeoning industry could be a huge revenue driver for the country.